Your footballing philosophy defines who you are as a manager and in Football Manager 2019 the tactics system has been revamped. 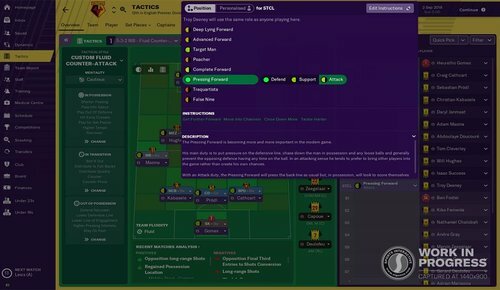 We’ve added so many things to this area in the last few years and player roles in particular have become more important to both FM and the real world, but we felt that with all these additions and other things we wanted to add, we hadn’t successfully presented them to you, the managers, in a cohesive manner so you could get the best out the power at your fingertips and cope with the new additions we wanted to make for this year. 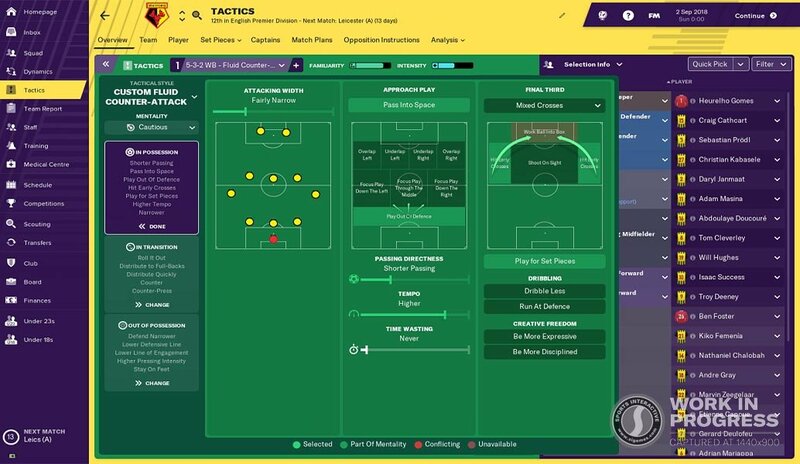 Last year we introduced the pre-match briefing and we have built upon this for FM19. Firstly, you’ll notice that the briefing has been redesigned make it easier to navigate through and clearer on how you can talk to your team, with more options available. Your assistant manager will also provide recommended topics for discussion. Gegenpressing, if this & other taglines for tactical concepts work as they should I will be very, very happy. Nope, from what I see in the screens you set your formation once and that's it, those two formations are just for a visual indication of which players are gonna press or not, or what happens in transition. And I'm glad wibble-wobble isn't back (if I'm understanding this correctly! ), this is much more sophisticated and simple. These changes look great, it's exactly what we've needed for a long time IMO, they even got rid of team shape, yes! 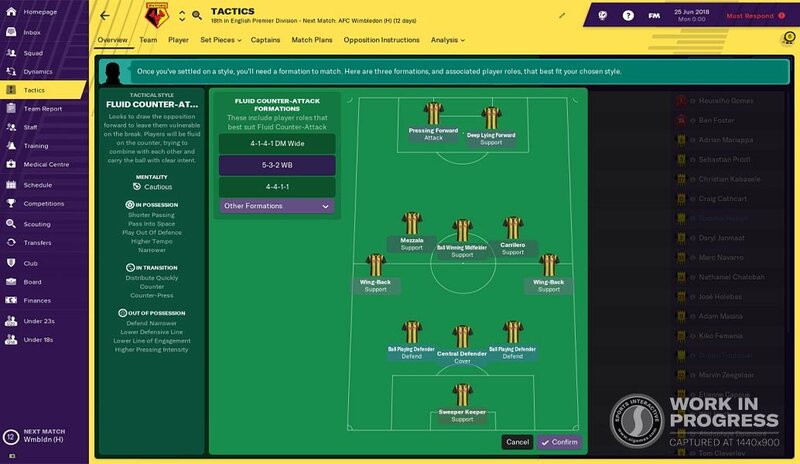 Can't wait to get FM19 now. I don`t think they got rid of the team shape. In the 6th picture you can see at the bottom TEAM FLUIDITY: FLUID. Isn`t that team shape? Thanks for Splitting the Over lap/Under lap options for both wings instead of both doing the same. Some very good ideas and new features that look excellent on paper, not thrilled to see that team fluidity/team shape thing still in the game though. I'm really liking this! 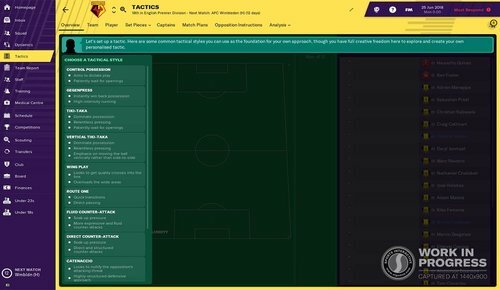 Transitional instructions are more than welcome, and something I've missed in FM so far! Going to be fun to experiment and try to see if I can really replicate Klopp now! Looks great, I'll be honest. Agreed. If they removed team shape it would have been perfect. Looks so much nicer now splitting out the team instructions into logical areas. With the styles too this should really help with building tactics generally. 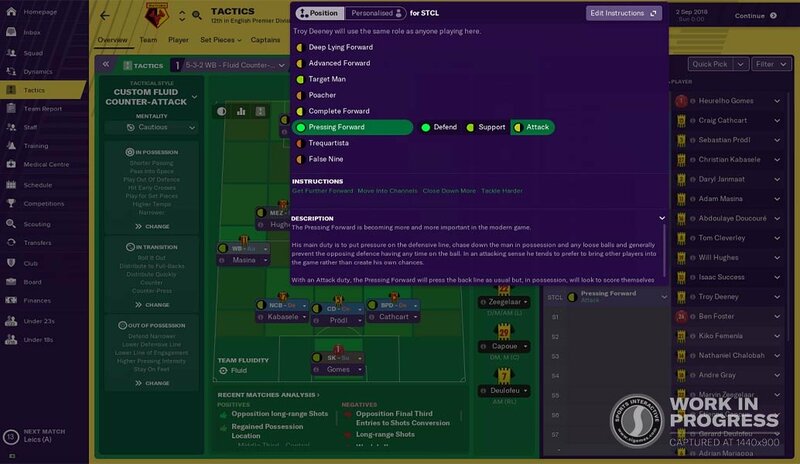 I do have concerns with how the AI managers will cope & if we will end up simply looking to beat the tactical mind of someone at SI who created links for the AI to use when trying to create a cohesive & workable tactical gameplan. Fingers are firmly crossed that my skeptical thinking is unfounded. Damnit, you're right. I don't see where's the button for setting it though... bit weird they'd put it separate somewhere else. I'm also excited to see if my Klopp-esque tactic will still work great for the 3rd game in a row. And now I can even incorporate gegenpress! Isn't this available as match plans? At first when I saw that In Possession/Out of Possession/In Transition screen, I was very worried that WIB-WOB was coming back. But no, having read through it all, I can understand what it all means now. 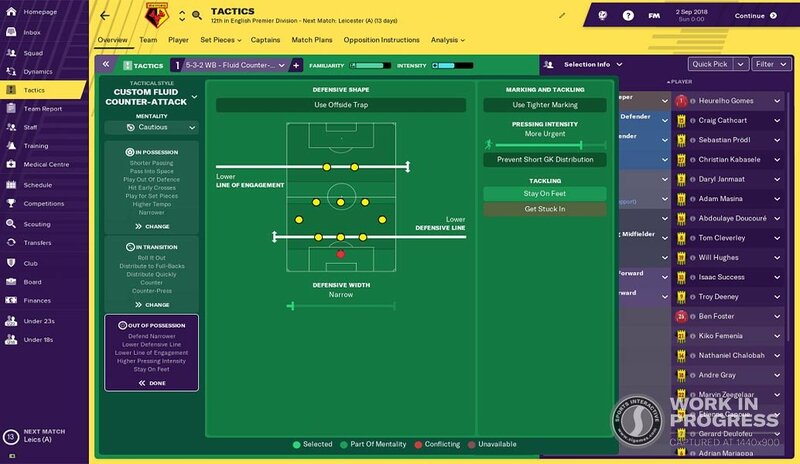 Everything looks a bit clearer (from tactical styles to mentalities and instructions), and though I suspect the new screens will take a while to get used to, there's plenty of reason to be encouraged. ..and tjat judgement i always reserve to how it looks on the pitch then and how the AI can work and react with and to those tools. I see the Defensive Forward role was renamed to Pressing Forward. Well, it's more descriptive, I presume. Looking forward to these changes. 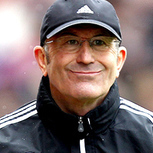 I've had the feeling during the last entries that your tactic couldn't adapt to the different phases of possession. Like they always played the same way. 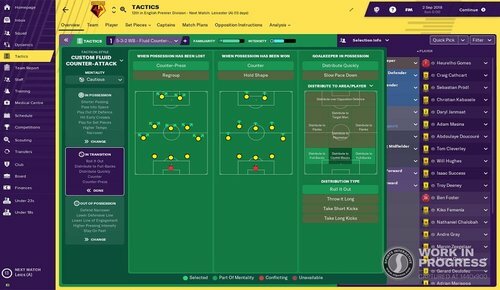 Great idea to split everything into phases of play, now the module looks much more similar to how tactics are actually built. I love it. Real Madrid? They play fantastic passing football but are more direct than the likes of Barcelona. Also great to see and other new things. Great job, well done SI! This looks absolutely great. 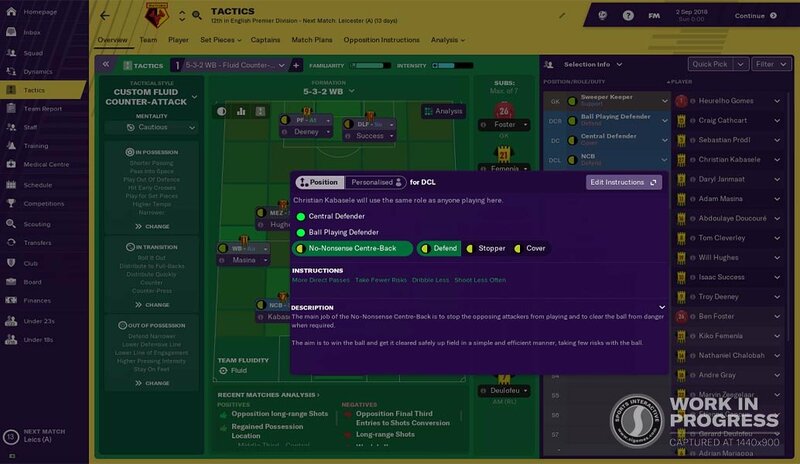 Freedom to set up the line of engagement when in defense and more control over how the team responds in transition should be really helpful for anyone looking to set up effective counter-attacking tactics. Be interesting to see what the detailed instructions are, but chatting to someone else we think it's Sarri-ball. Glad to see this is largely going down well, guys, keep the first impressions coming. 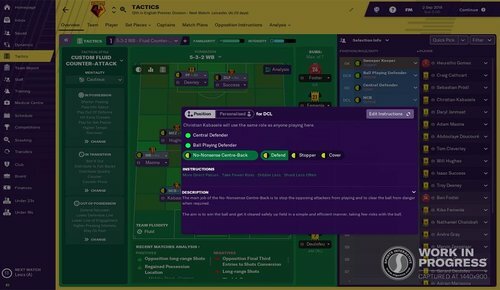 Addressing the Team Fluidity/Shape issue, yes it is still present in-game but is now altered indirectly by other factors rather than being a direct choice the manager makes themselves. If instructions you give your team and players give your team a fluid style, you'll be told, likewise if your instructions combine to form a structured shape, that will be represented too. I thought "vertical tiki-taka" was Barça under Guardiola (keep the ball but attack) and "tiki-taka" Spain under del Bosque WC2010 (keep the ball forever to be sure not concede any, and hope a goal eventually happens somehow and you win 1-0). Yes, looks like it could be that way for me as well potentially, will give full FM a go this year. I think (alex confirmed whilst I was writing this post!) the idea is fluidity is set by default with the new 'tactical system', which is probably an improvement as it's never been a very intuitive function. 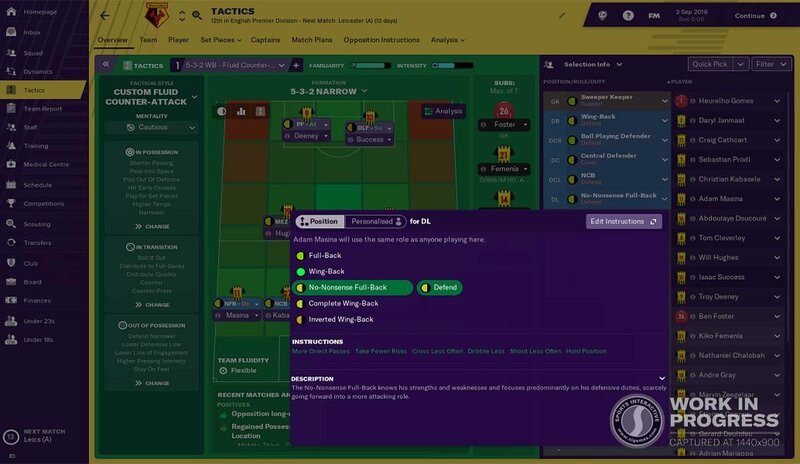 Hopefully the work done on this and especially on a transitions phase means that tweaking fluidity (often in a counter-intuitive manner) is also less important for things like compact defensive shapes or high presses. Barca didn't seek to move it vertically quickly. 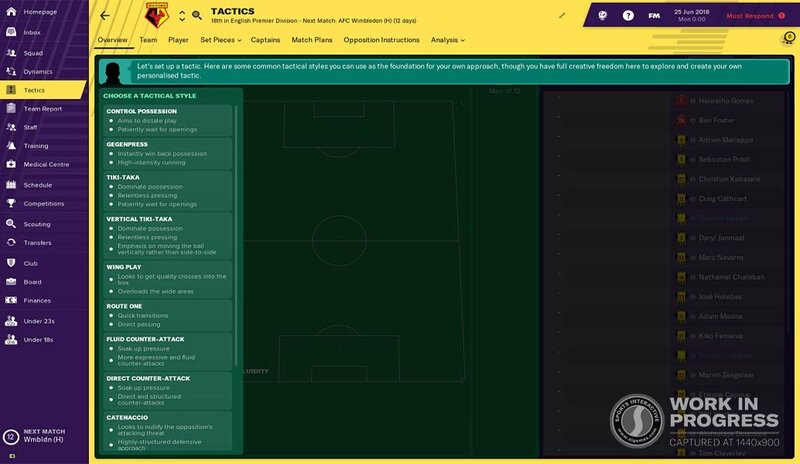 Otherwise I'm pretty optimistic about the tactics changes, the 'create a style' section looks great for those who find tactics too complex, and the transitions bit seems to fix some of the legacy issues around trying to get your team to behave the way you want to in different sections of play. No Barca under guardiola is pure Control with slow tempo, keep the ball and make an opening. just change the name ? Interesting, I guess it's definitely better this way, but if this is how it works, I wonder if showing team shape at all is worth it, can't it become a bit confusing for the user? I mean I guess it's probably a result of line engagement, defensive line etc, and I wonder if this might result in things like, people setting a deep line engagement and a slightly higher defensive line, to simulate a very rigid, defensive, compact playing style, and the game telling them their team is "fluid". Also I'm a bit worried, if that's a sign that how line engagement works under the hood is to just set mentalities according to how team shape worked in the past. Because if that's how it works, won't it ultimately have repercussions when in possession, when the TI is meant to only affect out of possession settings? But I'll wait a bit to see how it plays out in game. Makes sense to me. 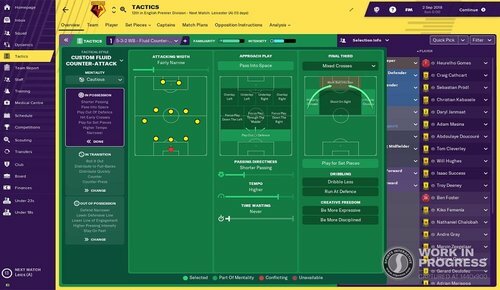 It can sometimes be too easy to make contradictory tactics (say, defensive with a lot of Attack roles, or Fluid with a defensive setup). Step in right direction for me. @Neil Brock Will this revamp be included in FMT 19 as well? Hype level suddenly reached maximum. I've been waiting for seperate instructions for attacking/defending phases for years. 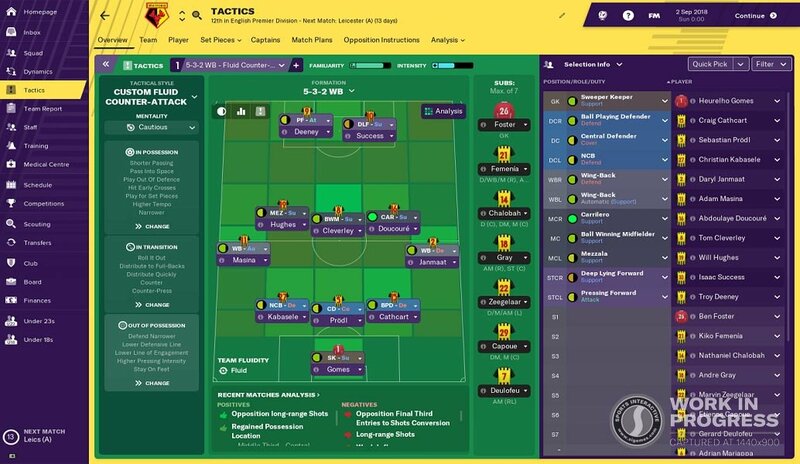 FM19 can't come soon enough! Now I've looked at it all in a little bit more detail, I think I am actually quite disappointed. These changes really seem to just be UI and UX changes to the interface, very little actual change or thinking into how tactics work or what you do. I was hoping for more change. These 'style' changes are really just moving around functionality that already exists, making it a touch clearer what settings are doing. Fine, thats a positive change, but it feels like its the only change that tends to happen from year to year. We are still mainly working with the same sliders under the hood, they are just glossed up with new definitions and moved about. Just feels like a nod to get new players in more than anything, which is understandable, especially when so many people find the current system confusing. I guess I was hoping for something more... innovative. Wondering whether retain possession option taken out from TI's. Well you just decreased my hype.